Fraud is a major concern for nonprofit organizations, so if you have been hit with fraud attempts in the past, you may be looking to place certain restrictions on your donation pages as well as other areas where you accept credit card transactions. If there are any specific countries you'd like to block (whether by user's location or their credit card issuing country, or both) you can add those additional precautions in your Flipcause account. To add additional security filters, go to your Flipcause Dashboard > Settings (in left-hand sidebar) > Payment Security Settings. Once in a while, for more advanced attacks, you may also need an additional layer of security. 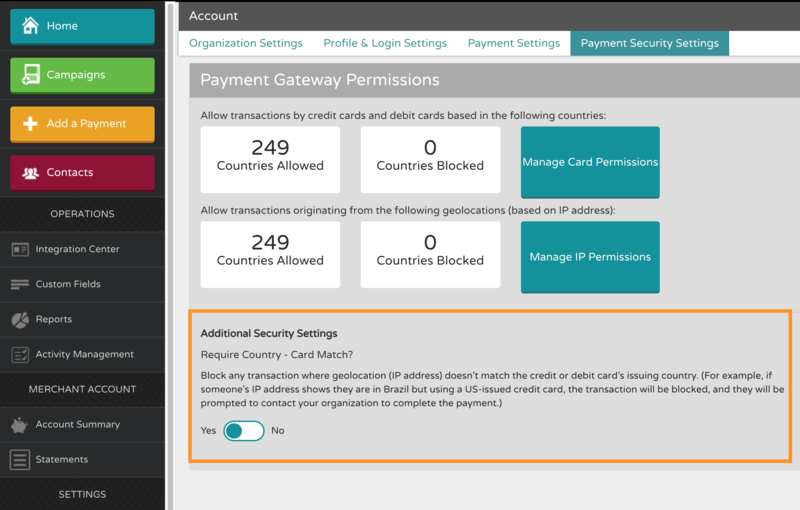 You can enable the Country - Match requirement to block any transactions where the issuing country of the card doesn't match the user's geolocation. Because this could likely block legitimate payments from your donors, we recommend using this a short-term block only when needed. Once you set these up, if a transaction matches your block criteria is attempted, the system will tell them that the payment has failed and they should contact your organization to complete the payment.